Our grantee partners are working on multiple levels to secure legal reform, provide access to services, and raise awareness about the rights of women and the need to take action. 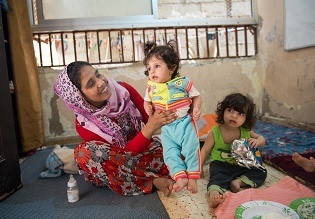 With your help, Global Fund for Women can provide critical support to women’s groups in Lebanon, Iraq, and Jordan working directly with women and children refugees to create safe spaces, meet unique needs like healthcare, and teach women their rights so they can drive lasting change. Global Fund for Women’s Jane Sloane shares her experience of a refugee camp in Lebanon during her October visit to the Middle East, and explains what our grantee partners are doing to help women and girls affected by the refugee crisis. The devastating civil war in Syria has cost over 300,000 lives, displaced more than 11 million people, and created over four million refugees. The UN predicts there could be 4.27 million Syrian refugees by the end of 2015, creating the worst refugee crisis since the Rwandan genocide in 1994. Women and girls are disproportionally affected. They comprise 79 percent of the displaced population and have been subjected to sexual violence and trafficking as a result of the conflict. Walking into a refugee camp is like walking into a desperately overcrowded slum. The camps are only one kilometer long and accommodate between 25,000 and 37,000 people. Refugees struggle for even the most basic of needs. For electricity, families must string live wires to dozens of other wires, criss-crossing low above the tiny walkways around the settlements. Every few weeks, someone gets electrocuted. Water from the wells in the settlements is salty, so all drinking water has to be brought in and bought by the refugees. Many houses are about to collapse, and most people needing care are not able to access hospital treatment. Those most seriously ill die. One of our grantee partners shared with us that Syrian children are drawing bombs, missiles, and people dead on streets when they first come to camp—later their drawings change to trees and homes as they settle in and get support from psychologists. Giving women new life and hope in such situations is critical. On our trip to Lebanon, my Global Fund for Women colleagues and I saw the phenomenal work women’s groups are doing in support of women from Syria, Palestine, and Lebanon living in refugee camps. In Beirut, we spent time with our grantee partners The Lebanese Women Democratic Gathering, Tadamon (which means “solidarity”), and Palestinian Women’s Humanitarian Organization, among others. All of our grantee partners are adapting their work in the face of the crisis so that they can provide outreach and support to Syrian women refugees. These groups are providing counseling (including support for women who have been abused); training in women’s rights; health services; legal advice; vocational training programs; and more. These incredible women’s groups are also focusing efforts on long-term solutions, including changing discriminatory laws that result in child marriage, trafficking, and child labor. One of the most direct ways our grantee partners are supporting women to build new lives is by helping women establish their own livelihoods. They provide tools and training for women to create small businesses. One woman received $350 worth of tools from a grantee partner, and used those tools to prepare and sell traditional sweets. From the money she made she grew her business, and her son bought a trolley to sell sweets in front of schools. From this she earns about $200 per month. Two sisters created a yoghurt business with use of tools provided by grantee partners. Another woman is using sewing machines to repair dresses and make curtains; these curtains are in demand as people rebuild their homes. The money is certainly needed. 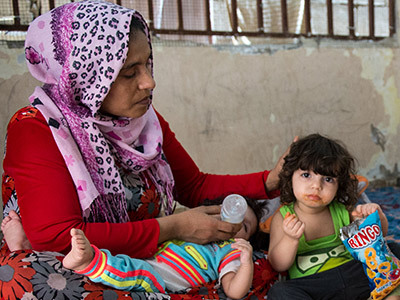 With many Syrian women not using contraception, birth rates remain high. Lack of access to health care means that there are high rates of deformity, disability, and mortality among newborns. During our time in the camps we saw children with physical and mental disabilities, and heard of others who were so severely disabled that they were essentially kept highly medicated due to lack of health systems and support. What grantee partners have recognized is that one of the best ways to continue to engage the women in the camps is through their children. At the same time, the children are often the lightning rod for all the violence and frustration their parents experience, and so children need support as well, to ensure we don’t lose another generation. Our grantee partners are working on multiple levels to secure legal reform, provide access to services, and raise awareness about the rights of women and the need to take action. Grantee partners are also taking important practical steps, including introducing yoga classes for children and parents where the well-being, energy, and engagement of those children attending has been transformative. At this moment, we are at a crossroads. Countries are beginning to divest their aid funding from the refugee camps, and the refugees are receiving little support. Such devastating conditions will no doubt breed populations so desperate for change that they will sign on to any religious or political force that offers them the promise of salvation. We need to exponentially increase funds to grassroots women’s groups in order to transform these camps and communities and demonstrate that we’re committed to—and acting for—a very different world. In Syria, women and girls have been acutely impacted by the conflict and exposed to a wide range of violations. Women in Turkey discuss the growing crisis, unique challenges for women and girls, and growing threats to human rights. 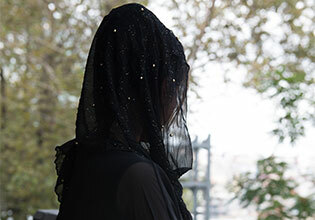 Rozina is a courageous 22-year-old Yazidi woman who asked for her story to be shared widely. This is her story.